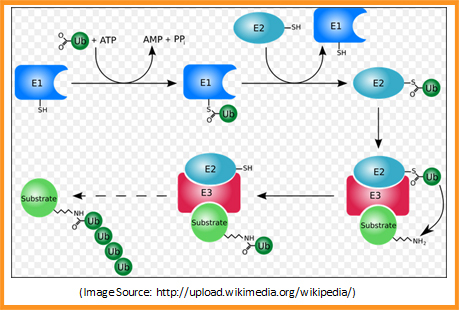 Ubiquitin mediated degradation is the selective degradation of various forms of damaged proteins that are tagged by ubiquitination (attachment of ubiquitin to the target molecule) and are degraded in the proteasome, a complex intracellular structure composed of multiple enzymatic complexes. The end products of its activity are, in fact, small peptides suitable for antigen presentation or amino acid residues that can be recycled within the cell. The critical role that this pathway plays in cellular signaling coupled with increasing validation of the therapeutic potential of targets in this pathway is accelerating interest in this field among both academic and pharmaceutical researchers. BioVision is pleased to offer a variety of reagents to the researchers doing research in the Ubiquitin Proteasome Pathway.